Mr. Do! is an arcade game created by Universal in 1982. Similar in gameplay to Namco's popular Dig Dug title, Mr. Do! was also popular in the arcade and saw ports on a variety of home video game consoles. The object of Mr. Do! is to score as many points as possible by digging tunnels through the ground and collecting cherries. 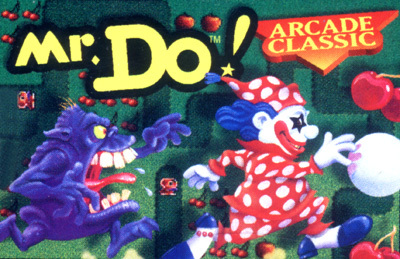 The title character, Mr. Do (a circus clown), is constantly chased by monsters called Mini-Dinos, and the player loses a life if Mr. Do is caught by a monster. Cherries are distributed throughout the level in groups of eight. Bonus points are awarded if Mr. Do collects eight cherries in a row without stopping. A level is complete when all cherries are removed or all monsters are destroyed. Mr. Do can defeat Mini-Dinos by hitting them with his bouncing "power ball" or by dropping large apples on them. Each time the score passes a certain threshold during play, a letter from the word "EXTRA" appears on the playfield as an Alphamonster, and the player can defeat or be defeated by this monster in the same way as a Mini-Dino. Defeating an Alphamonster awards that letter to the player, and collecting all five letters of the word completes the level and awards the player an extra life. Alphamonsters eat any apples they encounter, which makes them difficult to crush.